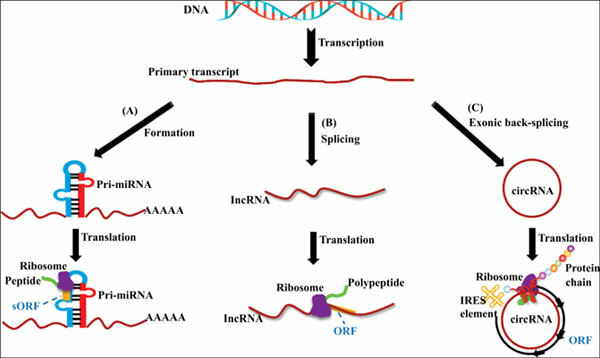 Background: Considerable evidence has indicated that most noncoding RNA (ncRNA) transcripts act directly as functional RNAs rather than as encoded peptides. However, a recent study of ribosome occupancy reported that many large intergenic ncRNAs (lincRNAs) are bound by ribosomes, raising the possibility that they are translated into proteins. These lincRNAs contain either Internal Ribosomal Entry Sites (IRES) or short Open Reading Frames (sORFs), and other translation elements, which can be translated into peptides with physiological functions. Conclusion: This review discusses three major types of ncRNA-encoded peptides (ncPEPs). First, microRNA(miRNA)-encoded peptides (miPEPs) are translated from their primary transcripts of miRNA genes and can promote the development of plant roots. Second, a long ncRNA(lncRNA) containing sORF encodes a 90 residues long regulatory peptide. Upon the amino acid response, the lncRNA-encoded peptide reduces the activity of mammalian Target Rapamycin complex 1 (mTORC1) and promotes muscle regeneration. Third, a circular RNA (circRNA) of the Na+/Ca2+ exchanger gene 1 (NCX1) exon 2 transcript encodes a truncated NCX1 protein exhibiting the Na+/Ca2+ exchange activity. It is also of worth noting that the majority of ncRNAs is not translated. This review summarizes the current understanding of the translatability of ncRNAs and the functions of ncPEPs in cellular processes, which may provide novel insights into the roles of ncPEPs. Keywords: Large intergenic ncRNAs, internal ribosomal entry sites, ncRNA-encoded peptides, long ncRNA, circular RNA, mammalian target rapamycin complex 1. Keywords:Large intergenic ncRNAs, internal ribosomal entry sites, ncRNA-encoded peptides, long ncRNA, circular RNA, mammalian target rapamycin complex 1. Abstract:Background: Considerable evidence has indicated that most noncoding RNA (ncRNA) transcripts act directly as functional RNAs rather than as encoded peptides. However, a recent study of ribosome occupancy reported that many large intergenic ncRNAs (lincRNAs) are bound by ribosomes, raising the possibility that they are translated into proteins. These lincRNAs contain either Internal Ribosomal Entry Sites (IRES) or short Open Reading Frames (sORFs), and other translation elements, which can be translated into peptides with physiological functions.